What's going on at my home church? I've never written a review for a book, so this is a first for me. I wondered how I would begin by giving a synopsis on the book, but to be honest, I think I'll have to restrain myself from telling everything. The twin brothers, now obviously in their early 20's, wrote the book at the ripe old age of 19. Something that we really don't see too much of these days is a student just beyond secondary school age writing an inspirational story. Of course, they would agree that not too many other teens have done the same. But I think they would be just quick to speak up and say, "Why not?" The series of accounts the young men tell are stories that move, encourage, convict and yes, inspire anyone to take a step beyond the comfort of the normal routine. 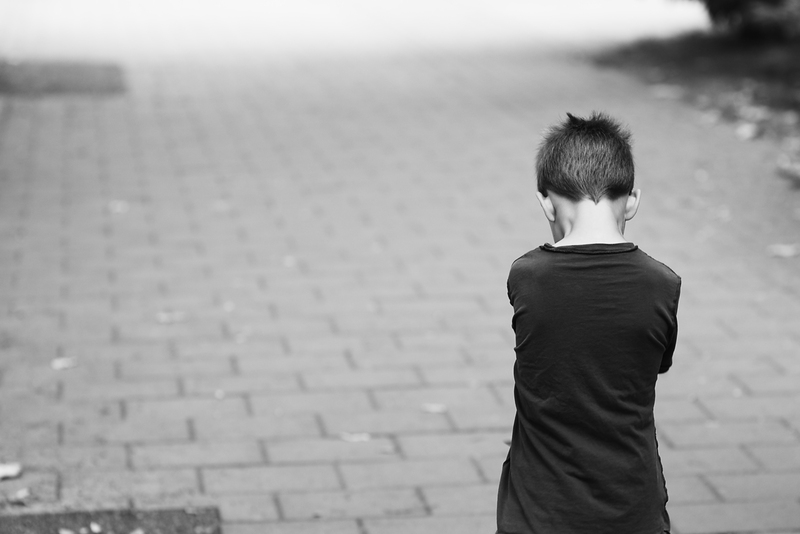 They all but 'double-dog dare' their own generation to do the things that no one seems to think that teens can muster up the strength to accomplish. The challenge goes far beyond the typical cry to be a good citizen, but to press the limit of your own circumstances to see the greatness that we are all capable of. I don't think these young men know how to say 'status quo' anymore than they want to meet it. By the time you reach the middle of the book and see their simple, yet sturdy 5 step process to excel and 'Do Hard Things' you can bet that a person of any age (even 35) can be prodded to look at his/her own life and process what steps can be made to do better in life. I firmly believe we all have been created for a purpose. Unfortunately, most simply sit and wait for that 'purpose' to creep up and bite them all the while slapping at the opportunities like they were poisonous. 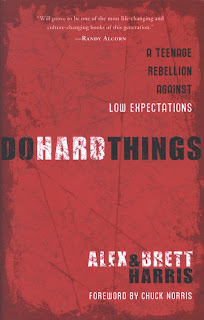 Doing hard things, ugh, doing the right things are hard to do, yet Brett and Alex as well as others they list in their book have paved the way for a new generation of teens to break the mold and do great things! I recommend this to any teen that longs for a life of making a difference. For a person to realize that you don't have to travel far off, earn millions of dollars or even get a driver's license before you can begin changing your world is an invaluable lesson and an encouraging testimony to all those around you. Read this book and really take it serious, you may be surprised how serious people begin to take you as you live it out! If you are the parent of a tween, teen or young adult I would highly recommend this book for you to read first, then pass it along to your child. Don't just buy it and then hand it over expecting them to act different. Do this with them, it will be hard,but isn't that the point? Rest in the fact God is near: 19:4-7 Elijah is running, but God has not left him. God is patient with him and comforts him. Elijah is strengthened, prepared and then is abel to stand again. Move Forward (in His strength not ours): Verse 8 Elijah begins to walk. God provided the strength Elijah needed. The bread and water...like the Word and Spirit strentghening us for the good work already set before us. We move in obedience. It might be slow, nervous or tear-filled, but we move in obedience and God is faithful to strengthen. Know that YOU ARE NOT ALONE: Verses 11-18 give Elijah assurance that God is with him, but not only that...HE, by his soverign power has shown Elijah that really is not alone. We can rest in the fact that God is near and yet he still provides us with others around us to comfort us and encourage us. He knows this is something we need. Continue the work He has set before you: Verse 19 simply begins with "and he departed from there"...God gives the strength, assurance of covenant relationship and then sends us back to do what we have been created for. We will be attacked from time to time and we are prone to crumble. Seeing God's faithfulness and patience from this passage alone gives strength to weary hearts that we might stand and move again out of obedience, for His glory. Proverbs 15:1 A gentle answer turns away wrath, but a harsh answer stirs up anger. It was my sixth grade year and I had been 'going' with a young lady for a few weeks although we never went anywhere, but I think you catch my drift. We never sat together at lunch, went on any dates (for the fact neither of us could drive and my ability to go to the movies on any given weekend was a slim chance), nor did we really even talk or pass notes...it was a pretty fruitless 'relationship'. So, one day I decided to end it. I know, it might sound cruel but I wrote her the break up note. It was short, to the point and done...or so I thought. The next couple of days were filled with sneers and stares in the hallways of the school. I got wind of rumors that a fight was coming my way in an attempt to revenge the broken heart I had just sown. Then, after the third day, after 3rd hour, I was surrounded at my locker by six (count 'em) angry faces with the most bitter of all being the dumpee and might I add the only female of the bunch. She had gathered some feisty friends to put some fear in me that the threat of a battle with them was nothing compared to what was coming my way. Then I heard his name in a low smirk of a tone, "Mark is gonna beat you up!" Are you kidding? Mark was 9th grade cousin of my 'ex' and he known for his skills in beating up those that cross him or even looked at him funny. I was terrified. I was sweating the rest of the day wondering when it was going to happen. I was thinking all the time how his huge fists would slam me to the ground for the wrong I had done. Then it dawned on me...I've never seen Mark, I don't even know what he looks like. How am I gonna know who he is? A week went by and it seemed to die down. My name was quickly forgotten by the young lady who by now had other things on her mind...or so I thought. I got the once-in-a-lifetime chance to go to the movie the following Friday night with a couple friends so I jumped at the chance. We got to the show, had some snacks and were sitting about 15 rows back watching what was sure to be a life-changing movie (yeah, I have no idea what we went to see) when all of the sudden I see this guy on the front row stand up, turn around and begin searching for something saying, "Where? Oh, I see." Then, proceeding to stand up on his seat taking a step he began to walk over all the rows of seats (and people) until he comes to my row, jumps down and flops down right beside me. So, what do I say? "Hey." Yes, I've been called brilliant a time or two in my day. He responds with a corresponding "hey" and then introduces himself as Mark. I'm in shock, wondering if this is all really happening. It turns out that the big bad Mark is this five-foot, one hundred pounder with long greasy hair and a really smelly denim jacket. He said he was the young lady's cousin and he wanted the low-down on the nasty break up. I simply told him the truth, no frills and non-threatening. It was what I had been taught to do in this situation...besides I was a five and a half foot two hundred pounder, so it's not like I could have outrun the guy. Gentle honesty was the policy for the night. It seems hokey now, because the reaction that I got was not the one I expected. I was thinking of blood and spit flying all over the place, people pointing and laughing and an oxygen mask over my face while I was being hoisted into the ambulance...instead Mark just looks at me and says, "Ok, I understand. She was angry, but she couldn't give me a reason to come and pound you so I just wanted to know the truth." Believe it or not, he then thanked me and asked if I would come up to the front with his crew and finish the movie. I had been dumped by my friends early in the evening and out of a bit of left over fear I accepted the invitation, "I'll just walk around if that's alright." He nodded an agreeing response and stomped his way forward over the rows and people again ending at the front. I learned some valuable lessons that night. All the cheesy lines my dad had given me to say to a bully really had some effectiveness behind them. Being able to handle the pressure of the moment and not let the fear cause me to cave in can really happen. The fact of following scripture as a means to dealing with life can and does work. And if something as simple as that truth is real...what other truths can I find out about in scripture? This prompted me to take a better look at what it is to be a Christian and what that means. Beyond ritual. Beyond tradition. Beyond religion to living my faith. Who would have thought a skinny greasy-haired kid could have prompted that? Blessings come in all different packages. Just a test. If this works, I'm obligated to update without excuse...rats! He's giving away a calfskin ESV Bible...what a prize! Do you know how cool you would look if you had this...?!? So, recently I've joined a new gym...a boxing gym. I know, unbelievable for some that may be reading this - for others that really know me - you've expected it for years. I've taken a real liking to Muy Thai (like the photo above)...not that I look or even resemble the photo at all. My form is more something to laugh at rather than fear. But, the new experience has been nothing short of the most fun and physically demanding time I've ever had. The challenge of being able to last even a few minutes ,beating a heavy bag while your lungs feel like they are going to explode and your shins are beet red and glowing from the repeated kicks, your elbows are burning from slamming into the pad...this is when you begin to learn where your limits are and where you're willing to push past them. It doesn't mean he got it all perfect, or didn't even have regrets to a point - but he does show us to push past the past and live now, not just for the moment but for the future. Your enemy is not the smart mouthed foe or the distastefully dressed young lady... Paul was chained to a smelly soldier - he still sang praises and shared the joy God had given him. Quit whinin' and put your gloves on...life throws some mean elbows sometimes. A life with Christ is worth everything. We took off to the local costume shop, even though it wasn't open, and they let us in! We browsed around looking for the perfect outfit. Then we saw it! A ratty looking long haired wig complete with a beard and mustache. We paired that up to a ball cap, dirty flannel shirt, faded jeans and threw on some extra dirt and it was complete. Chris took on the burden of becoming the 'homeless man' and wore the duds with pride. He stood at the edge of the rural highway that led up to our church one Wednesday afternoon holding the sign you see above. He looked awful! He stood there and waited. You see each Wednesday night we had supper prepared for all the members and any guests that may come...it was a tradition. So, in a place where 90% of our members would be passing by, there stood homeless beggar Chris. We had some serious lookers, only a few that interacted. One guy, on his nightly run, passed Chris by and slapped a $20 in his hand! Only to have Chris yell seconds later, "Hey, I'm not homeless, it's just a trick!" What a look that guy gave! But it gave him the chance to explain just what we were doing. I tell you all this simply to tell you a little about Chris himself. The stunt of holding a sign was just a small dose of what he was like. He had the kind of humor that fit into everything. He was tall, thin and just wanted to experience life. He would help so much in the ministry preparing and giving devotions at events, helping set up and clean up. Nothing was too big or too small for Chris. Then, about a year and a half later, a couple of weeks went by with no Chris. I mean, he just didn't show up to any of the events, wouldn't return calls, like he had disappeared. He hadn't gone away but he was depressed. He had pulled away from his relationship with God to pursue other pleasures in life. The typical stuff that any young guy would deal with; the girl, the job, money, a place of his own...nothing that we don't go through. But he had totally (long before the 2 weeks absence) stopped pursuing God. He knew the truth...that is he knew Jesus. He understood what it was to share the one hope we all can have through Him. But he got lost in all the confusion this world dishes out. A few months later, on a clear afternoon while Chris was home alone, he put a loaded .22 pistol to his chest and pulled the trigger. His life ended that day. His legacy tainted with despair. 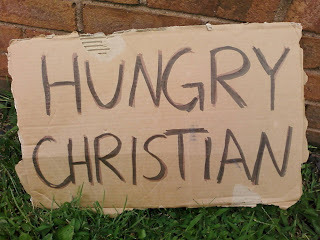 I've kept that cardboard sign to remind me that even as a Christian we can be hungry. Hungry for things of God, but choosing to eat the pleasures of the world. An old saying goes like this, "That which you want to live, you feed. That which you want to die, you starve." What are you feeding your spirit? Matthew 13:22 rings clear when I think about this story. I can think of so many times I let my own emotion rule the day. Times when I, understanding the truth, still fight with my own selfishness. Today, if your wondering "is it all real?" Then take a moment, stop and consider how faithful Jesus has been to you. The moments that when you look back you can notice the mercy and grace and providence of our Lord. He wants you to rest in that when the present moment is in turmoil (Mark 4:35-41). Rest in that promise.